Enhance the interior of your Volvo S60R/V70R with a fully reconditioned and upgraded Steering Wheel, featuring smooth and perforated Nappa leather and Alcantara suede materials. If your steering wheel is starting to wear out or has worn out, we have a solution for you. ViVA Performance is proud to offer comprehensive rebuilding services on worn out Volvo S60R/V70R Steering Wheels. We are able to offer fully re-skinned Steering Wheels in smooth Nappa leather with contrast thread/stitching in various colors. Alternatively, we can offer upper and lower portions of the Steering Wheel in other material such as dark grey Alcantara suede and Perforated Leather. 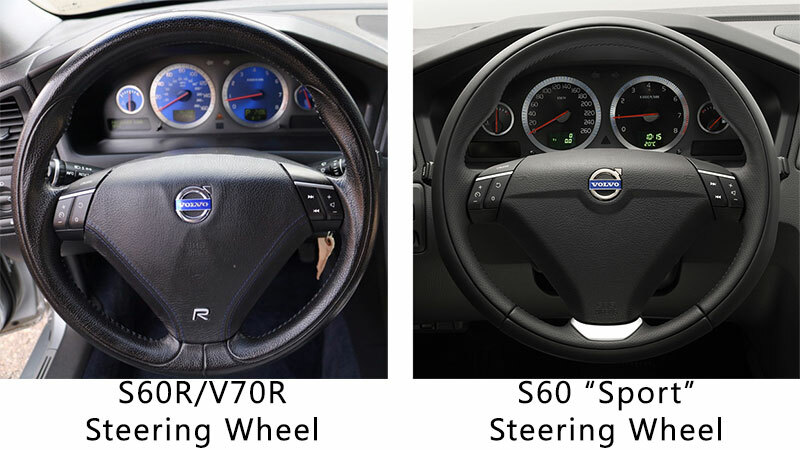 To minimize down time on the customers end, we can supply factory S60R/V70R steering wheels, or S60 T5 "Sport" steering wheels (popular upgrade). If you return an "identical" core back to us, we will refund you the core charge. Typical lead times are between 4-6 weeks from the order date. **This is the most popular upgrade we offer. If you prefer a custom combo of color and patterns, please Contact Us for a quote. Other vehicle makes and models are also available for steering wheel refinishing services.